Several of our past and current members have written a personal account of Studebaker vehicles in their lives, growing up with Studebakers, for some from when they were children and this ultimately leading them to joining the club. Following are some of their stories with more coming soon……. Please click on PDF below for the full story of the run. Quite a few people came out of the Office to have a look and were suitably impressed….All being well I should be able to show it at Redcliffe in September at the Club Concours…which I did & won President’s Choice Award! It has been a long-term project, started back in the early 90’s. I converted it from left hand drive, which wasn’t too difficult because we had a parts-car of the same year, which had the right-hand drive parts needed for the conversion. When purchased, it was minus the engine and gear-box and some panels on the front section nose-cone, were missing also…I was fortunate enough to locate a right hand drive dash panel new from USA, because the donor car had been converted and still had the dash panel as left-hand drive…We removed the body and all the undercarriage and components were over-hauled and painted before the body was re-fitted. I had the dash panel and other components re-done in the wood-grain finish, which many of the cars in those years were finished in this way. The engine which I rebuilt also came out of the donor car, but had to be completely over-hauled, it was sound and was a good power-plant to keep the car original. All the brakes were overhauled, new tyres fitted to sand-blasted and painted wheels. I also rewired the complete car and changed it over to a 12volt system, keeping the signal lamp system in its original form. The 6 volt horns are fairly loud connected to the 12volt system, but you don’t have to use them often, so they are not a big drain on the battery. We originally purchased the car from a guy in Newcastle, who had imported it from America and had advertised it in the Stude News and my father Walter bought it from a photograph. He had it transported up to Brisbane by a local friend who had a new Chev Truck and was anxious to try it out on a long trip.. My father Walter passed away in 1992 before the restoration was started, I feel he would be quite pleased with the final result. Long time members of our Queensland Studebaker Car Club, Harold & Phyllis Ireland celebrated their 60th Wedding Anniversary on 12th March, 2015. Congratulations to both of them, what a wonderful celebration. Qld Studebaker Club Members, Gwen McLoughlin and Lorna Venema remember stories from their early days for our Club’s 40th Anniversary Celebration Year of 2009. As a past club President Gordon and Gwen McLoughlin have lots of Studebaker moments to remember. John and Lorna Venema have many tales to tell. Lorna particularly remembers when they found their M16 Studebaker truck. 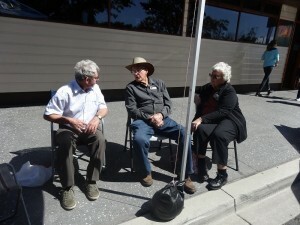 Gordon, Carmel and myself attended the Studebaker Meet at Cooma. There was a large gathering from many other clubs and great cars on display. Sunday we set off for Thredbo with Lindy and Mike West. While in the Chalet at Thredbo it started to snow, a wonderful sight. Carmel came back to tell us she was staying awhile longer with Lindy and Mike. We were all ready to go in our 1959 Silver Hawk when Gordon wound down his window and got a lap full of snow off the roof of the car. The others came back to the Motel with a bag of snow in Mike West’s Ambulance. Monday morning on the point of leaving, Mike called out to the other club members to say goodbye. As they were coming off the balcony, Mike threw snow balls at them. Don’t think we’d be welcome back there again!! Last years 40th Anniversary Celebration Year was a great opportunity for members to write their Studebaker stories. Lorna Venema has added a special memory of her early Studebaker days. Hi, Old and New Stude members. I was just going back in time… WOW! A good memory of one of our tripa to my hometown Beechworth Victoria, was when we were at Bob and Joy Gpdleys home having a sing along and a BBQ. Somebody told John about Mr Cronin in Dayesford, he had some old trucks so we ended up going there and buying our M16. It had carted wheat for many years, so we checked the oil and brakes and headed for Brisbane. We arrived at Jerilderie and the timing chain broke. I wanted to leave M16 there but it ended up with ME towing it with a rope of many knots 300 miles to Dubbo behind my Rambler Rebel. I went on strike and left it at Mr Bells! We went through Narrabri and John had to buy a Stude Station Wagon which also broke down several times as well. Bill Cunnington went back with John and towed the M16 with the Stude Station Wagon. John did not talk to me for weeks, I told him I would help with Studies but I was not going to die for them! Thank you all for many years of great friends and lots of great times. 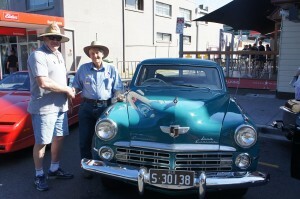 Ross and Pauline Oldman, Queensland Club members have made another discovery of Studebaker treasures. Read their story here and there are more photos in the Photo Gallery. Ken Patterson and Owen Offen are an institution within the Studebaker community in New Zealand and more particularly within the South Island Contingent. Pauline, my father and I were treated to an afternoon of their hospitality recently at their base, the garage in St Andrews and their homes. I believe that between them they have more than eighty years of combined experience with the marque as owners and restorers of a wide range of Studebakers. Their interest has seen them set up shop years ago in an old garage in a little township called St. Andrew’s which is located a few kilometres south of Timaru in South Canterbury. The garage has been kept operational and they have all the facilities available to an old fashioned country gargage to indulge their passion. The garage is located beside the main highway and passing traffic has learnt to keep a look out for the latest Studebaker parked around the old forecourt. Not too many people with an interest in Studebakers fail to call in for a chat when they see a Stude parked out the front. It would be fair to say that Ken and Owen are no longer in the first flush of youth and over the last few years they have had to make the difficult decisions as to which vehicles they want to keep. The inevitable need to reduce their collections to a more manageable size has forced them to become a little more selective with regard to what cars they keep for posterity and what they move on to willing purchasers. Ken showed us the following vehicles on the day that we visited. Harry Van Wees from Western Australia recently sold him a lovely example of a 1963 Avanti. This car has been treated to a no expense spared restoration over the years and presents beautifully. It is a credit to Harry. Of course Ken found a few things that he wanted to do to make it his own so subtle cosmetic and mechanical improvements have been made recently. The car now sports a brass name plaque near the gearshift identifying Harry as the creator of this beautiful car. Definitely a keeper this one. I visited Ken a few years ago and at the time he was getting to the final stages of a complete nut and bolt restoration on a 1961 Hawk. The finished article is a credit to him. The attention to detail lavished on this car is astonishing, particularly in the out of the way areas where none but the most knowledgeable would know to look. The car is one of those that every time you take the time for another look something different pops up and grabs your attention. A lifetime of experience has been put into subtle improvements to the car. No expense or time has been begrudged this car. An impressive feature is the rich leather interior that has been completed in the rare Hawk 400 style. Ken has sold the car to a very lucky member of the Studebaker Club and I believe that it will travel to a good home in Christchurch. The Black Hard Top President was the next to come out. A lovely example of a low mileage one lady owner car from Illinois that has been kept totally original. Back at the garage Ken has a 1960 Hard Top Lark undergoing the full treatment. It is early days yet but the signs are very good. It appears that the engine may well hide a few improvements that will provide more than average performance to the old girl. This car will round off the collection when finished. Owen concentrates on the pleasure of ownership and using his cars as often as possible. Prestine show cars are not his ambition, more build them right and drive them often. A recent knee replacement has slowed him a little but it will not stop the work being completed. Hiding in a corner of the St Andrews garage is a 1960 Hawk that has an interesting history. This car was built in right hand drive for the Earls Court Motor Show. To make the right impression all the period factory goodies were apparently included. A bit of provenance never does any harm when selecting the right car to put your time into. I believe that Owens intention is to restore her back to the Earls Court specification. Parked outside was a 1955 Champion four door in very original condition. This car is Owens daily driver. I know that because it flashed past on the highway. It took a few kilometres to catch him. When he offered me a drive I understood why. This car hammers when you apply some throttle. I am not sure what the tweaks are but they seem to do the job. The car drives and handles like a much younger vehicle. Back at Owens home we found a 1960 Lark Hard Top with all the period fruit that you can imagine including a continental kit, spats and sun visor. Pure 60’s extravagance. The vehicle that Pauline fell in love with is the Lark Utility pictured below. Offered a drive she went off with a big smile and came back with an even bigger smile. Owen purchased this vehicle years ago from the builder. When you walk around it you can see the high professional standard that went into the work. First impressions are that Studebaker built this vehicle, perhaps they should have. What a competitor it would have been for those such as the E1 Camino. Look at it from any angle and the proportions and finish look right. We all came away from our visit somewhat wiser and very impressed with the hospitality and the friendship offered by Ken and Owen. Photos of more Studebakers from the trip are available in the Photo Gallery. Thanks to Qld club member Warren Hucker for sending this in. …. running with the West Coast Outlaw Pro Mod Association at Sacramento Raceway during the ‘Funny Car Fever’ event on the April 23-24 weekend. It was only the second time out for the new team and this new car. The first time they went to Bakersfield a few weeks prior to the ‘Funny Car Fever’ event to get some testing done so they were ready to rock at the home track. The team qualified first with a 6.09 second pass at more than 240 mph on the quarter-mile track. In the first round of eliminations, the team improved their qualifying time and set a new Sacramento Raceway track and West Coast Outlaw Pro Mod association record with a 5.90 at 248 mph . Car driver Bret Williamson and his team are the first team from the West Coast to run a five-second pass in a Pro Mod car. Anderson won the next two rounds of eliminations and backed up the 5.90 pass with a 5.92 in the final round to take the event win for a clean sweep of the event. The team is based out of Sacramento. Co-car owner Don Carter resides on El Dorado Hills. Williamson is the driver of the Studebaker and lives in Campbell, Ca. The other co-owner of the car, Rich Gore, grew up with Willismson but he now lives in Georgia and flies out to each race to watch his car run. Jeff Buttler is the crew chief of the race car and lives in Folsom. The team couldn’t have done any of this without their sponsors: Folsom Lake Toyota (Folsom, Ca), Granitize car care products (South Gate, Ca), Marsh’s Carpet (Sacramento, Ca), Hones Engine off Fulton Ave. (Sacramento, Ca), Network Office Systems (Sacramento Ca), Quarter Mile Designs (Folsom, Ca), and Gladiaator Challenge (Apple Valley, Ca). The next race for the 1953 Studebaker will be the ‘Nitro Nite’ at Sacramento Raceway on June 11-12. They will once again be racing with the West Coast Outlaw Pro Mod association class. Chas and Robin Bonds 1963 ex Police studebaker Lark 2 door. My first knowledge of Studebaker vehicles was when as a Primary school kid in Western Victoria I saw one of my schoolmates fathers, the local publican, driving about in a Black Land Cruiser, about 1950. It was difficult to tell from a distance wether it was coming or going. In 1965 arriving home after 2 years overseas with RAAF, I scored a posting to Amberley, Qld. 1400 miles from my family home in Victoria. I felt the need for a vehicle with Long Legs and reasonable Economy if I was to make the trip at all often. A mate and I went to Melbourne with the mission to buy such a car after searching the Age one Saturday and seeing Noel Tishler Motors advertising a Studebaker Hawk. had driven and to make the acquaintance with the new owner, but never for the wrong reason. Lucky Me. I soon realised that so much attention from The Law was maybe not such a good thing so decided to forego the Powder Blue with Grey Top colour scheme in favour of Valiant Metallic Charcoal with Cream Top, much less conspicuous. While at Amberley I found that a Grease and Oil Change every Pay night, Thursday Fortnightly, was necessary to keep pace with my driving routine. A round trip to Victoria over a 4 day Weekend or to Canberra and back in 2 or 3 days was quite the norm, fuel was cheap and ‘Lizzie’ did have Long Legs and was Economical at 25 mpg if not hurried, that was stay below 70 mph. A posting to Newcastle found Lizzie and me making the round trip to Brisbane on Pay weekends, always without incident and with 2 or 3 passengers to keep me awake. Robin and I married in 1967 and Lizzie took us caravanning to North Qld. On our honeymoon then back to Newcastle with all that we owned. So ended the regular trips but at any opportunity we used to load up Friday pm and not return home until late Sunday having been to ‘who knows where’ in between. Lizzie became well known along the East Coast as the Studebaker with the Shepherd dog in the back seat. Another memory is driving about with no 1st or reverse gear, Cunninghams Gap in Bumper to bumper traffic with a smoking clutch is no fun. Soon after Andrew was born, I was posted to Richmond, 40 miles west of Sydney. So a return trip to Newcastle each weekend except when rostered for duty was the go. One Sunday night late I found that I could not make more than 40 mph up the Tollway after Hawkesbury Bridge.Next Morning I found that the distributor points rubbing block had disappeared and the distributor lobe were acting as the points. Late night, but it did not destroy my faith in Studebaker reliability. Once we had settled into South Windsor married quarters we found that a 2 door car with a young baby and a large dog competing for space and attention was not a great situation, so when one Saturday a ’65 Cruiser became available we checked it out and after some refurbishment ‘Goldilocks’ came to stay. Life was good. Lizzie needed Gearbox replacement and later on an engine swap, all without any great drama, Studebakers were like that. Late 1971 I was on pre Discharge posting back at Amberley and job hunting. Metropolitan Fire Brigade seemed to offer more challenges than Hunter Bros. at the same wage which was 1/3 reduction per the RAFF, What price freedom?? In 1972 or 73 I became aware of SCCQ meeting at Hamilton Library Hall once a month, Night Navigation Runs, BBQ’s, Gymkhanas, kids picnics, National Meets, Concours’ etc. There was always something happening. We even discussed Studebaker mechanical problems at times. The collecting bug was alive and well at most meetings, I have no idea who holds the record for most Studs rescued, that is a story of many volumes, I wonder if John V., Terry K., Mike W., Des S., to put a few on the spot could come forward with some Stude Tales, Tall, True Or Otherwise but nonetheless interesting. see that the seven Australian Clubs have been given Chapter Status within the SDC and now look forward to lots more local news in one of it not the Best ONE MAKE CAR CLUB Magazines ever printed. Carmels Dad, Gordon McLoughlin Club President in the early ’70s, makes her trophy presentation. Hello everyone, my name is Carmel McLoughlin, daughter of Gordon and Gwenda McLoughlin who were members of the Studebaker Car Club of Queensland for many years. I will be 47 this October and we joined the club when I was 9. I wish Mum and Dad could have been here tonight but Mums body is failing her and it would have been too much for her to travel. Dad very rarely goes anywhere now if Mum can’t go too. Even though not a member anymore I would not have missed this night for anything so I could represent Mum and Dad and be able to tell them all about it. Dad was known as El Presidente’ for the years that he was President. I can best fill you in on the comical side of the club as seen through a child club member. All the serious stuff can be told by the serious members. I am glad that this night was held now and not in 10 years time as my memory probably would have failed me and I would have just made up a whole heap of stuff, but what I am going to tell you tonight is all fair dinkum. As frightening as it sounds. Mum would drive the Silver Hawk every day to pick me up from school and all the kids knew it as the Bat Mobile. I just saw it as another strange car that Dad owned. I can remember when I was little driving around in Jaguars, SV1 Valiants and finally ending up droving many different Studebakers myself (not that he ever let me drive the Hawk – even when I waw 25). Dad loved his Hawk and that guy at the Rocklea Markets who rested his fruit crate on the fin of the Hawk went home with a sore jaw that day. All Dad said after clobbering him was ”You won’t do that again will ya Mate”. Every friday night we would go to Bert and Jan Sievers house on the other side of town for Chinese, games of pool and copious amounts of alcohol (that’s the adults – not us kids). Dad would leave slightly under the weather and drive all the way to Camp Hill. Now, in between their house and our house there were three major hills that followed one after the other. Well, we were air borne over each and every one of them every Friday night. Dad would plant it (much to our excitement – I loved it) and he would change from a driver to a pilot for a few seconds. Of course to me this was totally normal. Im sure every Dad drove like that. Then there were the day trips to many different places and of course on the way home after many stubbies and cans had been consumed ‘socially’ it would be nothing to see 4 or 5 Studes passing 4 or 5 normal cars at once on the Bruce Highway or any highway or back street in Australia for that matter. There again, that’s normal isn’t it? Once Dad was driving down to Melbourne in the Hawk for work and he was stopped by the Cops alleging that an aerial radar system had clocked him at 240kmph. Dad stood in front of the shiny chrome plaque on the side of the Hawk which read ‘Supercharged’ and proceeded to say to the Police that the car was built in 1959 and it couldn’t possibly go that fast. He said they should check their equipment. The Police must have believed him as he never heard another thing about it. Actually the capacity of the engine and the supercharger combined made the car quite capable of those speeds and that’s exactly the speed that Dad was doing at the time. What a legend! How about those Easter holidays, heh? What kids get to go to Adelaide, South West Rocks, Cooma, Wagga Wagga, Newcastle and I am sure there were more but I cant remember. I dont think I ever complained, even when Mum and I would tell Dad we were bursting and he would fly past the only service station or shop for miles and tell us its only another 100 miles or so and we’ll stop for petrol then. Ah!…those are the memories that warm the cockles of my heart (or my bladder). Thanks Dad. The kids Christmas parties were fantastic too. I can remember the Plantation was a great venue. Always heaps of food and treats and good old Santa. It was very hot in that suit so the condition for being Santa was they had to keep their fluid intake up, so every Santa had to have a stubbie or a largie so they wouldn’t dehydrate while giving out the gifts. I think I sat on Santas knee up until I was about 18. Dirty Santa!! Finally there was the educational input to my upbringing that I thank Mike West and his parties for. There I was probably 10 or 11 years at their home at Holland Park at the Stude parties belting out over Holland Park the beautiful tunes of the woodpecker song, or the hair on her dicky dido hung down to her knees song. I had no idea they were dirty at all, but of course no one told me to stop swinging. Ahh….what a well rounded education I had. I am sure there were many more but thankfully my mind has deleted them from the memory bank. They were the best parties. There were so many stories and good times that I would be here all night, so as Mum and Dad couldn’t be here tonight I would just like to say on their behalf, if it wasnt for the special friendships and life time friends and places the club has given us, it would have been pretty bloody boring growing up in Rocklea. 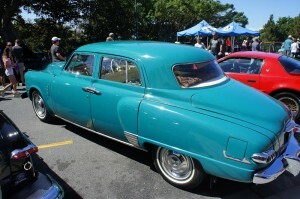 The Studebaker Car Club of Queensland was and I am sure still is a real family and not just a club. I thank each and every one of you for taking in the McLoughlins as part of that family. thank you again for having me here and thanks for the memories! Gordon and Gwenda restored this multi award winning 1959 Studebaker Hawk in the late 1970’s. With its new owners, members of the Qld club, it remains in excellent condition still today . This years 40th Anniversary Celebration Year 2009 has been a great opportunity for members to write their stories. Michael Cosgrove has added his memoirs to these ongoing updated articles of past and present members stories. The familys Studebaker 1936 President straight 8 and 8 seater. My earliest memory of the Studebaker vehicles in our family is our Grandparents 1936 President straight 8 and 8 seater. This car was equipped with ‘dickie’ seats, behind the front seat. My Granpops first car was a Hupmobile. A weekly event was when a Sunday ‘passenger’, after church would ask for a ride and be invited to hop on the running board for a lift up a steep hill, as the car was full of our large Cosgrove family. My brother John and I were allowed to push and finally drive the President backwards and forwards in the driveway and only just outside the gate. This car was eventually sold for 20 pounds to a second hand dealer, and the next time I saw it there it had a large dent in the boot lid. This was very disturbing, it had never had a prang. The last time I saw it, it was at Walters’ yard. Grandpops other car, was a grey 1947 Champion, in which the kids were taken to and picked up from school, and early morning swimming lessons at Langlands Park. Some Saturdays my Grandpop and I went to Walter Irelands yard to buy parts for the Champion. It was an amazing site, Studebakers everywhere. Bundaberg was a holiday destination in this car with my Grandparents and I was allowed to drive the Champion, at a young age ## from outside Bald Hills. That overdrive was a great thing on the highway, and the skill of acknowledging the oncoming driver was soon developed. (other gestures are used these days) . The law (parents caught us out) and that was the end of that. In 1964 my grandparents decided the Champion was getting a bit old. We went down to Howards Ltd and checked out the new Studes. I can still remember the green GT we stood beside and my Grandfather tapping the door with his knuckles. Too tinny he said! And V8….. The Champion was traded in on a 65 Toyota Crown Wagon. After Grandpop arrived home with this new vehicle, he had a change of heart and went back and retrieved the Champion. A visiting mobile mechanic kept it in good order and we were allowed to polish and vacuum it, keen to do for the pocket money. When I turned 17, I was fortunate to be allowed to drive the Champion to and from work at Evans Deakin Ship Repair where I was an apprentice (much better than the pushbike). Some of my mates at work were turned from being Holden and Ford owners to being Studebaker owners. It was also interesting to note the workshop electrician, Gabby Rayment also had a 1962 Studebaker as well as 3 boilermakers and Truck Driver Cliffy (Cruiser) Muller, who all owned Studebakers on the work site. These guys at the work Christmas Club lunch on occasion, tried out the Studes at the ‘Colmslie Hillclimb’, which is now the Colmslie Hockey Field! They drove straight up a very steep slope. But common sense prevailed and so did the Managment and these activities ceased. My first big trip as a licensed driver in the Champion was to Noosaville with passenger Gary Campbell, to visit Gabbys apprentice. What a trip. Every time I pulled the Stude out of overdrive the bonnet popped, kept grabbing the wrong button. Gary skillfully advised me every time this happened, he could envisage the bonnet coming over the windscreen. Our Lodgings for the night was a bunk on Michael Massouds fathers fishing boat “The Noosa”. Tucker for the night was Michaels mothers legendary Curried Prawns, yum! One occasion driving home from work, I noticed a silver GranTurismo coupe. I thought ‘What a car!’ About a year later I eventually traded the ‘47 Champion to Walter Ireland for a 1965 Daytona sedan, with red interior and Moonlight Silver duco. Heaven had come early. It wasn’t long after that I noticed again the silver Gran Turismo and after leaving a Gary Smiths place I spotted a card on my windscreen which turned out to be an invite to join the Studebaker Car Club of Qld. I was amazed to find that the guy who owned the 62 Hawk who happened to be a chap called Des Skinner invited me to his house one day where I saw he had a ‘custom’ Austin A40 sedan. I couldn’t rationalise this Austin A40 parked beside a Studebaker, it didn’t work for me! I can remember being signed up at a club meeting by Bruce Panton who had some difficulty determining the exact wording to use on the receipt, obviously a practice not so well established being such early days. My first recollection of a Concours was on an acreage block somewhere in Tingalpa. I entered my 65 Daytona Moonlight Silver which I had purchased in good nick. I eventually found out it had been owned by the Brisbane Jenyns Corsetry industries. I was about age 19-20 when club meetings were held regularly at the Hamilton Library hall, and they were long. I remember John Platt as President and Russel Booth the Secretary. On meeting nights at about 9.45pm ‘the peggy’ had to go to the bottle shop to get ample supplies and usually the meeting ended on his return, or soon after. As well as Concours, Gymkhanas, and Observation Runs there was another social event, Bowling……. This event which was coordinated Australia wide, was the ‘Studebaker Indoor Bowling Tournament’. It was organised by Mike West, and a supreme team was assembled from Qld. Those clubs participating had to link up via phone to swap scores. Top scorer was usually Mike, who had the ability to put unreal spin on his ball, and strike consistently. Team members were Mike West, George Udovicich, Denise Fauth, Jeff Fauth, and Mike Cosgrove. We must have won a series at one time, as we are photographed around the Trophy (a Lark grille). Wonder where it is today? Michaels Studebakers which he has owned over the years – ’65 Daytona, ’63 GranTurismo and the ’66 Sports Daytona which he fully restored. It is great to be reminiscing with you old students again, and of course many second generation present, even third generation! 40 years, eh? 1969…. now there was a year slap bang in the middle of an era when if you can remember it you obviously were not really there! 1969 was an auspicious year for Queensland, the Queensland Conservation Council, of which I was an executive member was also formed, as was the Queensland Ornithological Society of which I am now President, although I do not remember those beginnings either, a bit like Woodstock, also from 1969. I became an aficionado of all of them later, I never took drugs, I never inhaled anyway. As a consequence of the memory lapse period around 1969 there was a lack of knowledge of the formation date of the Studebaker Car Club of Queensland. Along with a bunch of oldies, I was enlisted to help locate the year of formation. There are a few members who must have been there, Des Skinner, John Plath and Terry Knauth to name a few who should remember but like other genuine 69ers they seem to have lost their memories. One thing is certain, the Studebaker Car Club of Queensland was already off and running before the Victorian Club changed its name to Studebaker Car Club of Australia in a typical Melbourne geocentric manner which makes this club the oldest in Australia. A perceived lack of knowledge and maybe a lack of respect for the history is the main reason I accepted to address you tonight. This club has a proud record – you just need to scrape away a lot of crap to find it – a lot ! I have no doubt if the Qld club had not kept pushing the Victorian based Club we would not have the healthy, functioning, independent clubs around Australia today. I do not mean to demean the strong efforts from the other clubs, just to show tonight the early Qld story from my own biased eyes. I feel certain a truly National Newsletter where all the clubs contribute and there almost certainly would not have been truly National Meets run by independent clubs around the country. In the early 1970’s your old club connived with the Newcastle Club who just as jealously guarded their independence as we did. There was fertile rebellious ground there, Sydney was not bad either. I vividly remember a freezing overnight drive with Russ Booth, to whom this club owes a great debt and it is tragic he is not here tonight. We were in a Daytona with a typical air vent that would not quite close allowing a blast of New England night air in. The heater did not work as there was no thermostat, well, we did not need it in Queensland. We arrived at Doggies in Newcastle looking like we had done 10 rounds with Mohammed Ali. We met the Newcastle Gang for the first time and it has been all downhill since then, no…. I do not mean that! Lifelong friendships have been formed, Harry and Karrene, The Lynches, you know the usual suspects…. They even talked like us, but of course they were not as good looking, I know I have to be careful here as Harry is the following speaker. Most importantly we pushed and got the Biennial Business Meetings where amongst other things decided where the next National Meet was to be held. Cooma was presented as the first National Meet in 1975 but it was under the bona fides if the Australian Club and the rest of us were invited to join in. It was a roaring success, for the first time Qld arrived en masse scooping the pool in the Cruiser Class and winning many trophies in the Concours. I even entered the Motorkhana in a Studebaker Ambulance with a dozen people and a dog inside. As then President I was really proud of our Clubs efforts. Following Cooma, the Australian Club ran the first truly National Meet at Wagga Wagga in 1977 and the scene was set for Adelaide 1979 and our turn in 1981. We thought it too much an imposition for travelers to go all way to Brisbane and ran it at a central location of Dubbo. It was difficult to run from so far away but we now had a club based in Dubbo so our job was made a lit easier with their great assistance, we successfully ran a Concours and two Motorkhanas, one fast, one slow. The Dubbo experience has not really been copied as meets are now held close to the participating clubs base. I understand the lack of keenness for the Fast Motorkhana as it was hard of cars and those hoons from Newcastle won most of the prizes anyway, I see no excuse for leaving out the Slow Motorkhana, similar to the ones the Veteran and Vintage Car Clubs run. They should be the highlight as they are open to all members with a car where if you do not have a lot of money you cannot win a Concours. I loved the National Meets although I could never understand how my children were conceived at Cooma (Stephanie) and Wagga (Mark) as I was so busy at both of those meetings. It is also a mystery how they both looked remarkably like Bob Godley. Honestly, the formative years of the Qld club were the best days of my life. We ran monthly meetings, a yearly Concours, regular outings and displays at shows and Motorkhanas, much the same as you do today. We had a strange mix of members in those days, we had teetotalers and pisspots, deeply religious and atheists, tandem transport aficionados, the Dynamic Duo and that infamous Henederson Street Gang. Vehicles ranged fom Objects D’Art that could fit in beside the Range Rover in the Louvre Museum in Paris to Stock Cars racing at the Speedway who could forget John Ryan (or was it Geoff Hayes?) who totaled the Mini at the Ekka Speedway. What about the Dude Stude Drag Car that I bought with the 12.9 seconds still written on the windscreen? The Studie owners in those days were likened to Greyhound owners, some showed them at dog shows, some raced them at the Gabba and some just loved them as pets. The emphasis now is more on the show cars and that is to be expected that is sure to be appreciated by the purists, Des and Co. It is great to see how strong the club still is after all these years, I have great respect for todays club. I just thought you needed to know a bit of background of your early history, not quite warts and all. One of Mike and Lindys vehicles the 1958 Studebaker Provincial Hearse, photo taken in 1984. Growing up in the UK, the only vehicles I could tell apart were the Number 9 and the Number 16 buses. We had no connection with cars or anyone who owned one really. So when my carless family arrived in Oz and I immediately got involved with this great bunch of Aussies, at various parties, you can imagine how intriguing it was to find they were all talking a language, frequently which I had no grasp of – what the hell was a Studebaker anyway?? Daylight hours provided a few more clues, as an array of strangely beautiful cars came and went, that were a big part of the Stude Gang’s life. Eventually, a Lark was mysteriously purchased by the Stude Gang for me, an 18 year old art student, with the driving experience of a geranium but I learned to drive in the big V8 regardless. I remember picking it up at the traffic lights at Camp Hill very clearly – we jumped in when the lights turned green again, after viewing it whilst they were red….I even optimistically turned up in it at Coorparoo Licencing Centre attempting to pass my driving test but my (over) confident efforts scared the instructor wittless and he just shook his head and got out of the car, quite white, when we returned. Could not understand his attitude at all. I remember different Stude Do’s early on where you’d be required to race around large, open fields, as fast as you could go, dodging and weaving between orange traffic cones – what a hoot this club was!. My key had gone missing but no problem, the lads jammed a screw driver in the ignition and though it looked weird, worked really well. Louise Cosgrove and I went to the Art College together (that the lads affectionately renamed “The Girl Factory”) turning up in various Studes, including the Lark, Michael’s Cruiser, an Ambulance and once, even a studebaker Hearse – cannot remember how that eventuated though! The other students thought we were odd but who was having all the fun? The Qld Club always put on good trips and we went all over having fun in our cars; the trip to Newcastle one year really stood out, as I got to drive at length, very fast, a lot of the way, which impressed myself no end. scared to death of consequences. I had a lengthy period when I was trying to be plain sensible and so sold my Lark and tried a variety of perfectly decent other cars but Dicky knew that I always pined for another Stude and 5 years ago, called me up and said the fateful words “Have I found the perfect car for you!”. So, he drove me to Brisbane and of course, he was right – I wanted it as soon as I saw it but that was not cool at my age, so I waited till morning so I could pretend I’d ‘slept on it and thought about it’. Dicky had to take me straight back again! Now the ’65 Cruiser and going off on outings again is a wonderful part of our family life, which is and always has been one of the best parts of being a Stude owner and “growing up” in our club; the friendship, shared history, and good fun – it’s wonderful to be part of such a vibrant club and to think that the younger members in the club are now the age we all were when we first careered around the place in those funny old American cars, well, that makes me grin all over again. The 1927 Model EU Dictator 4Door Sedan owned by the family. Studebaker has always been a highly respected name in our family. The origin of this story begins when my Mum and Dad purchased a 1927 model EU Dictator 4 door sedan. This was around the end of the Great Depression time in 1938. Unfortunately when the Second World War was declared in 1939 and fuel became unavailable, Dad put the Stude on blocks for the duration. I believe that he actually drained the battery acid int a container, washed out the battery and stored it upside down. He repeated the process in reverse after wars end. Amazingly the battery was slow charged and remained serviceable for a considerable time thereafter. I have wonderful child hood memories of exciting and fantastic journeys that I experienced in the amazing stude. Most weekends our family enjoyed trips around the New South Wales countryside. Every year around Christmas time the faithful Stude carried our family on three weeks camping holiday to numerous destinations. On a number of these occasions our holiday was interstate Victoria, Adelaide and Queensland. This seems unbelievable today and I have no doubt that my enormous respect and admiration originates the Studes unquestionable reliability. I reckon my Dad summed it up nicely when he said, ” The Studebaker is the working man’s Rolls Royce “. I vividly recall one particular holiday to Queensland around 1951, our family were making their way towards Brisbane when the Stude broke an axle on the old Jimboomba railway overpass bridge. At that time the bridge was constructed with timber planks that were loose and uneven. I recall that back then the only buildings around the bridge were a small pub and a one room school and all the roads were gravel or dirt. We slept in the car for three days, we were parked on three wheels under trees in Cusack Lane, I was around 7 years old at the time. To this day I dislike lemonade because we had no alternative other than to drink it hot. I reckon it was 40 degrees in the shade and drinking hot lemonade in that weather is not easily forgotten. Dad was forced to wait a day for a bus to take him to Brisbane so that he could search for an axle. He took the broken axle with him for comparison. I remember that he eventually found one at “Valley Spare Parts”. Dad said it was a ROUGHIE’, it had a severely worn spline but it was the best he could find. Dad had to wait another day to catch a return bus as they ran only once a day!. We didn’t get to see Brisbane. Dad repaired the Stude while verbalising out loud a few of his well known saying’s like, “YOU MUDDY BUCKET OF PITCH”, he packed it in and drove nonstop back to our home in Sydney!. Story written by Qld club members Ross and Pauline Oldman. and friends over the Christmas New Year period. Museum. Following is the story of our interesting visit to this location. about 30 or so of the 150+ cars on display. Allow at leat four to five hours. There is a café so take a break over lunch on site. the Bay of Islands above Auckland. awaiting shipment to NZ or directly to clients. road network was apparently very large. in American cars mainly rests with now deceased independent marques. Han’s is a walking encyclopaedia and was very generous in sharing this information. car clubs. He agreed to show me around at short notice during the Christmas period. also made a small donation for his time while there.